Launched last September in Burbank, Starwest Studios is the newest addition to the Los Angeles dance firmament. 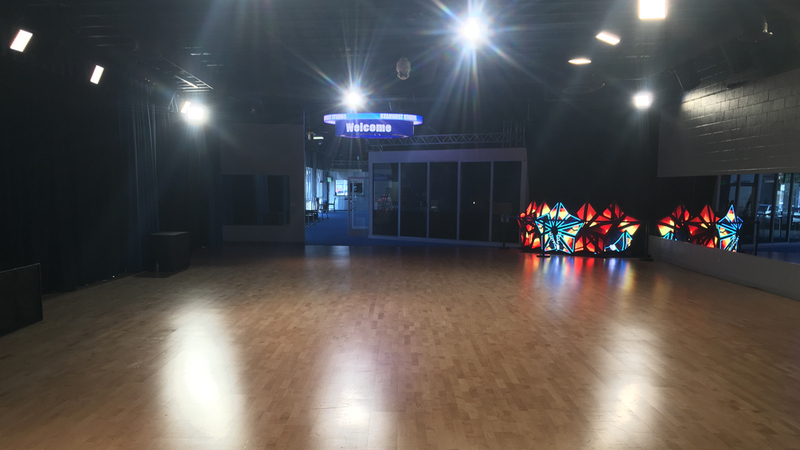 Partnered with Randy Jackson, former American Idol judge and well-known producer, Starwest is the world’s first dance studio and center that’s also a full-service broadcast production facility – boasting spaces for both music and video production. Starwest Studios Lot 2 houses a music recording suite, a live broadcast control room and a 3,800-square foot Stagestep clear-span sprung wood dance floor suitable for filming as well as large casting and auditions. Together with our CEO partner, Richard G. Stewart, Randy and I are extremely excited about the potential of this new facility to support Web-based, independent dance productions and broadcasts, a big growth area in the entertainment industry. One of the things we’re most proud of is the technology on display. We’ve dedicated Starwest to be a showroom for the absolute leading edge in broadcast, video, and production technologies, including a fully equipped broadcast control room powered by NewTek, an audio/music suite by Roland, and an extensive array of LED lighting from the Vitec Group’s Litepanels brand. The design of Lot 2 presented a unique set of lighting challenges. 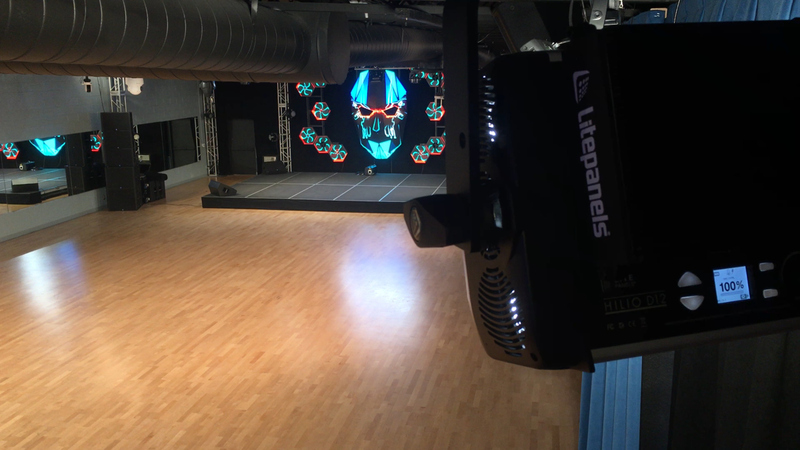 With 4,000 square feet of dance floor and robotic cameras mounted in the ceiling to capture up to 200 dancers at a time, it was important to be able to cover the entire floor without any dead areas or shadows. I knew from past collaborations with my long-time friend and professional gaffer, Litepanels Co-Founder Pat Grosswendt, that Litepanels LEDs are simply the best for film and television lighting. Pat and the Litepanels team created a lighting design consisting of almost 50 LED fixtures to ensure that every corner and every angle of Lot 2 would be covered. We have Astra daylight and bi-color panels mounted in the ceiling, and also battery-powered Astras on stands that we can move around the facility as needed; for instance, if we need to light talent on the fly, we can just wheel in an Astra. In the makeup room, as the staff applies makeup to performers, they can use an Astra to match the lighting the dancers will be under in the studio. The Astra’s tunable bi-color option makes it easy to dial in the right color temperature for the best rendering of skin tones. In addition, Litepanels’ Sola Fresnel LEDs give us the versatility to apply a spot or a flood as the need arises. We’ve also started experimenting with Litepanels’ brand-new Gemini 2×1 soft panel that combines daylight, tungsten, and red-green-blue LEDs to deliver highly flexible and precise color adjustment. So far, we’ve used the Gemini to produce a talk show, and we’re very impressed with its ability to present our talent in the best possible light. Since we’re using such a wide range of Litepanels lights throughout the Starwest facility, the Litepanels team uses us as a valuable resource for demonstrating the full gamut of their products to potential customers. In fact, I’d venture to say that Starwest is the only comprehensive “showroom” for Litepanels in Southern California, where people can see an Astra or Sola in use on-camera, with a ceiling grid of the lights being controlled by a Martin M1 Console. For ourselves, we can say that we’re big Litepanels fans because we know that each type of lighting will blend and match perfectly with the others. Also, we’ve come to count on every Litepanels light to be completely flicker-free at any frame rate, a critical requirement in a broadcast production environment. Almost as important as the lights themselves is our relationship with Litepanels. Based on their ongoing dedication and expertise, we know we can count on the Litepanels team to deliver a solution that will serve us well in the long run. With Starwest Studios, we wanted to create a production space that would be on the leading edge of innovation and could meet our personal creative needs as well as those of our colleagues in the industry. The first thing anyone sees when they enter Starwest Studios is well lit facility. We have achieved that and much more, but we could not have done it without the help of expert partners like Litepanels. As producer/partner of Starwest Studios, Sammy Oriti is an award-winning television producer and composer with more than 30 years in the entertainment industry.